In a normal deck, this is exactly what the name suggests—not the most efficient way to get to the place you want to go. Casting a 4-mana ramp spell isn’t great when your curve tops out at 5. In a deck well-suited to take advantage of that ramp, this is a key part of the archetype, as ramping into 6s and 7s can be very effective. This also pairs well with card draw, as casting a draw two into a 4-drop is a perfectly good way to spend 7 mana. 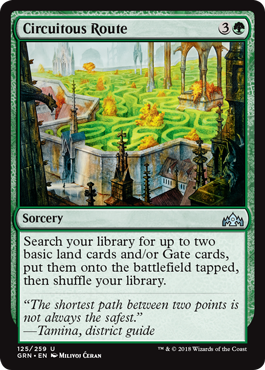 Between this and District Guide, there may be an uncommon-driven 5-color deck, though Urban Utopia and Lockets do provide some support at common.